last sunday, i wanted a quick dinner and had a hankering for sushi. ~r and i drove out to sushi domo . . . and it was closed. we headed back into town to sushi station . . . and it was closed. "Do you want to just get pizza at Mezza Luna?" he asked and I said no, suggesting we try Misako. . . which was open. no price listed. I assume that, given the options, '1' meant one piece. I pick out a few and circle the 2, thinking that would get us two pieces of each. And we get a few rolls. Our order comes out AN HOUR LATER (slooooow service) and there's a curiously large amount of sushi. I realize what's happened. The '1' on the menu is an order of two pieces; '2' on the menu means four pieces. So instead of eight pieces, we get sixteen. I try to catch the waiter before he brings out the rest of it. "Oh yeah," he says, "I usually warn people of that, but somefolks, they really like sushi!" which i guess means that I look like some sort of sushi-inhaling monster. 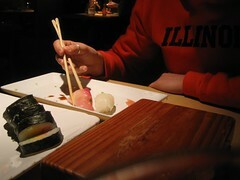 As he's explaining this, the rest of our sushi comes up and since it's already prepared, we have to take it. So we pound through our sushi dinner for ten and actually finish almost all of it. We're both stuffed to the gills (pardon the expression) with sushi. I mean, who stuffs themselves on sushi?! I was very sad. The menu was misleading! He should've said something! We got screwed! And to top it all off, the service took foreeeeeever! And now i will never go there again. In fact, I may never eat sushi again...except for in a few weeks when I'll be splitting a party platter at Akai Hana with cindy and our moms. And maybe grocery store sushi. But aside from that, never! ever! again! OH my god! I hope you didn't tip him. He blithely ACKNOWLEDGED that he should have told you, and then didn't offer to rectify the misunderstanding at all. Insane. I am so mad on your behalf. On the other hand, I could really go for $100 in sushi right now. Mmmm.